Matso’s Mango Beer. This one does what it says on the tin, beer (in this case a Belgian Blonde-style brew), flavoured with 100% natural mango = Mango Beer. 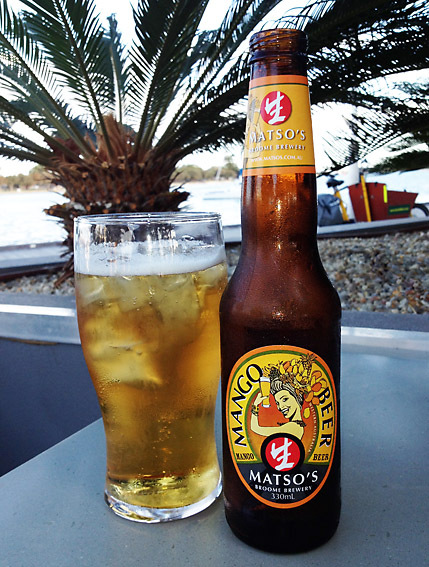 Mandurah waterfront ….. not a bad spot for a beer. I tasted mine at the waterfront in Mandurah, WA. The first taste was surprisingly good, a real fresh mango taste, clean and crisp. The beer was served with a glass of ice, like you might drink a Magners Cider, so I though I’d give it a go. Pouring over ice in fact made it taste more like a mango cider and I regretted doing it. Mind you, it did somewhat ‘pad’ the the drink out a bit, and at $9.00 a bottle I wanted it to last as long as possible. $9.00 a bottle seems to be the going rate for a beer round here …….. no wonder the mine workers fly in and fly again out as soon as possible! Here’s Angus & Julia Stone with ‘Mango Tree’ …….